One Kringle at a time. It’s how we approach, well, just about everything. 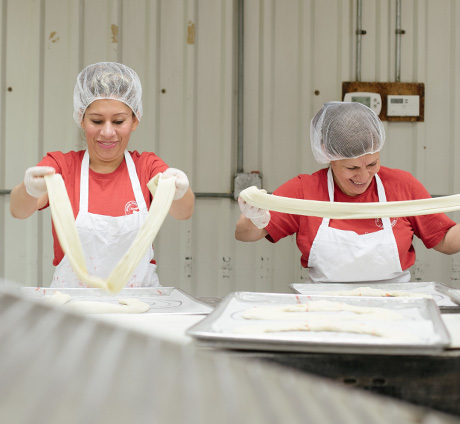 Our third generation family business is all about making sure we bake the highest quality Kringle for our extended family-our customers. 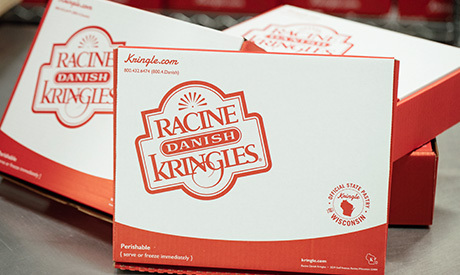 We're confident that once you experience authentic Racine Danish Kringles, your family will make it a tradition, just like ours. Our bakers begin early every morning to handcraft the flaky, buttery Danish pastry so many have come to know and love. Each handmade Kringle is filled with the highest quality fruit, nut or gourmet fillings and baked to perfection ready for you to share at holiday parties and special events, or to delight family, friends, neighbors and co-workers, and sometimes simply just because. Racine Danish Kringles was featured in the December 2013 issue of Food Network Magazine as one of their favorite recommendations for food gifts during the holiday season. 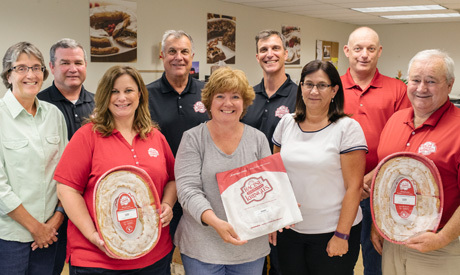 The Official State Pastry of Wisconsin, Racine Danish Kringles was also recognized as a Something Special from Wisconsin™ product, which is an organization that supports local farmers, food processors, entrepreneurs, as well as the Wisconsin way of life. Member of the Serengeti Circle Zoological Society of Milwaukee whose mission is to support the Milwaukee County Zoo, educate the public about wildlife and conserve endangered species. Racine Danish Kringles gives to many local charities throughout the year to support great causes such as the Children's Hospital of Milwaukee, Make-A-Wish Foundation, Zoological Society, The Hope House of Milwaukee, Worldwide Hunger Relief, Cystic Fibrosis Foundation, American Lung Association and many others. We are also proud to be certified as Wisconsin Dairy Kosher. Our high-quality point of purchase wood displays are ideal for deli, bakery, and dairy departments. They are easy to assemble, lightweight and portable. Our displays are easy to clean and maintain, making Kringle the perfect treat to increase your sales and maximize impulse buys. Read more about our wholesale program, or contact us at: 1-800-432-6474.